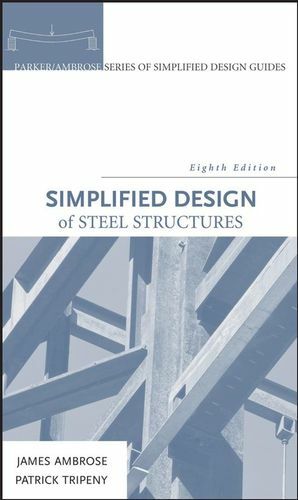 For over sixty years, a primary source for design of steel structures -- now revised and updated. 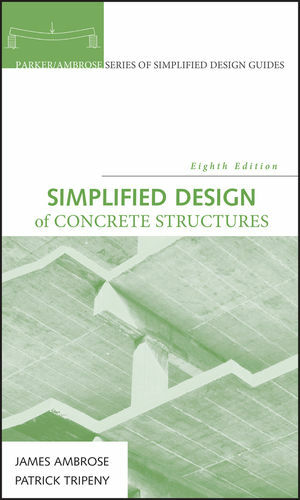 Examining a wide range of steel structures, building types, and construction details, Simplified Design of Steel Structures, Eighth Edition is a reliable, easy-to-use handbook that covers all commonly used steel systems, practices, and research in the field, reinforced with examples of practical designs and general building structural systems. Uses the latest American Institute of Steel Construction (AISC) method of structural design. Provides fundamental and real-world coverage of steel structures that assumes no previous experience. Includes valuable study aids such as exercise problems, questions, and word lists to enhance usability. James Ambrose is Editor of the Parker/Ambrose Series of Simplified Design Guides. He practiced as an architect in California and Illinois, and as a structural engineer in Illinois. He was professor of architecture at the University of Southern California. Patrick Tripeny is an associate professor at the University of Utah's College of Architecture and Planning. 1 Considerations for Use of Steel. 1.2 Types of Steel Products. 1.3 Development of Structural Systems. 1.5 Data for Steel Products. 1.6 Usage Considerations for Steel Structures. 1.7 Choice and Planning of Steel Structural Systems. 2 Structural Investigation and Design. 2.1 Situations for Investigation and Design. 2.2 Methods of Investigation and Design. 2.3 Investigation of Columns and Beams. 2.4 Investigation of Column and Beam Frames. 2.5 Approximate Investigation of Indeterminate Structures. 2.7 Limit States Versus Service Conditions. 2.9 Choice of Design Method. 3.1 Factors in Beam Design. 3.2 Inelastic Versus Elastic Behavior. 3.3 Nominal Moment Capacity of Steel Beams. 3.5 Design of Beams for Buckling Failure. 3.6 Shear in Steel Beams. 3.9 Manufactured Trusses for Flat Spans. 3.10 Decks with Steel Framing. 3.11 Concentrated Load Effects in Beams. 4.2 Slenderness and End Conditions. 4.3 Safe Axial Loads for Steel Columns. 4.4 Design of Steel Columns. 4.6 Column Framing and Connections. 5.4 Mixed Frame and Wall Systems. 5.5 Special Problems of Steel Rigid Frame Bents. 6 Miscellaneous Steel Components and Systems. 6.3 Tension Elements and Systems. 7.4 Investigation for Internal Forces in Planar Trusses. 7.5 Design Forces for Truss Members. 7.6 Combined Actions in Truss Members. 7.7 Design Considerations for Steel Trusses. 8.3 Design of a Bolted Connection. 8.7 Design of Welded Connections. 8.9 Control Joints: Design for Selected Behavior. 9 General Considerations for Building Structures. 9.1 Choice of Building Construction. 9.3 Loads for Structural Design. 9.5 Building Code Requirements for Structures. 9.7 Lateral Loads (Wind and Earthquake). 9.8 Load Combinations and Factors. 9.9 Determination of Design Loads. 10 Building Structures: Design Examples. Appendix A: Properties of Structural Sections. Appendix B: Beam Design Aids. Appendix D: Answers to Problems in Chapters.